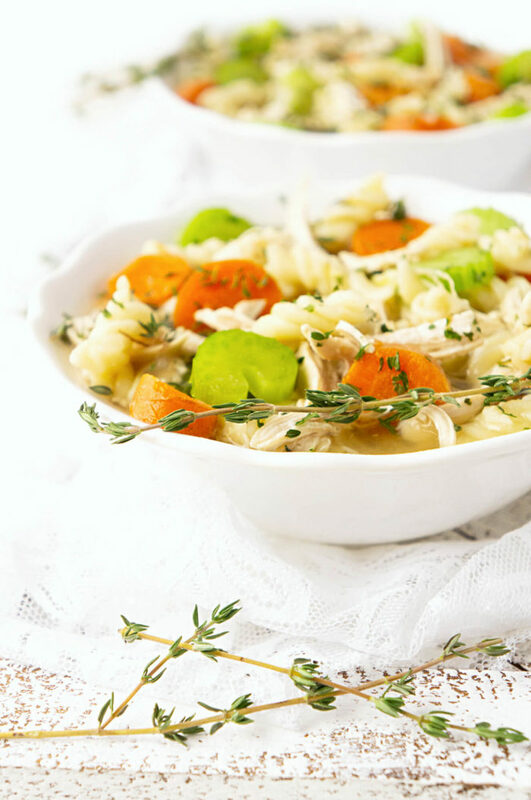 This homemade chicken noodle soup is the perfect dish to serve during cold and flu season and is much healthier than store-bought soup. Make up a pot at the beginning of the week for a quick and easy lunch or dinner throughout the week! 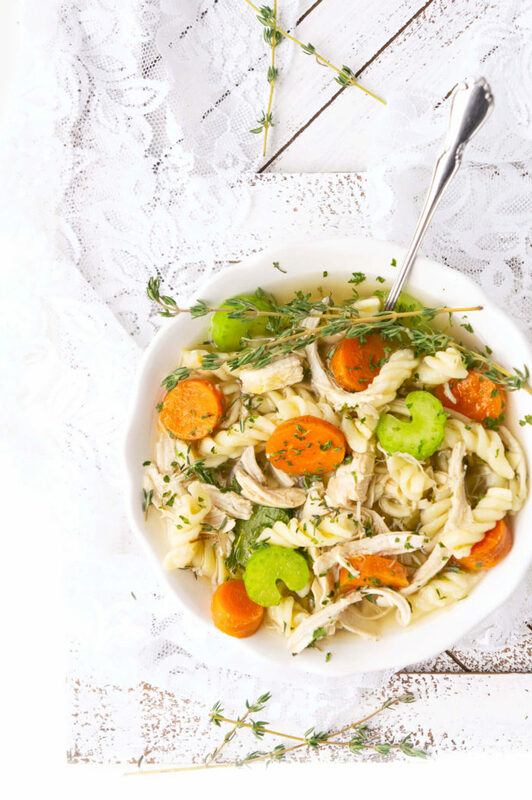 When I was growing up, my mom used to always make homemade chicken noodle soup for us when we got sick. It was just the thing she did to help us feel better. Although I didn’t enjoy being sick, knowing that my mom always took such good care of us and went out of her way to make us feel special is one of my fondest memories of my childhood. It’s a tradition that I always wanted to continue when I became a mother and had my own children. Totally out of the blue last week, my little guy got a cold. We’ve been fortunate that he didn’t get sick for the first 10 months of his life, but I knew it was bound to happen at some point. And it didn’t take him long to pass it along to my husband. So within a matter of a couple days, I had two sick boys in the house. 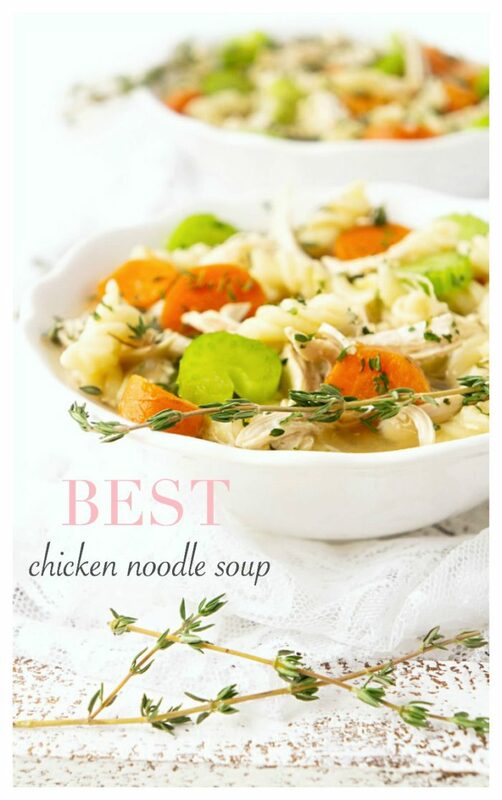 Instantly, the thought of her making her homemade chicken noodle soup popped into my head. So I set out to the grocery store to pick up the ingredients necessary to make chicken noodle soup the way I remember my mom making it, with a few small adaptations. 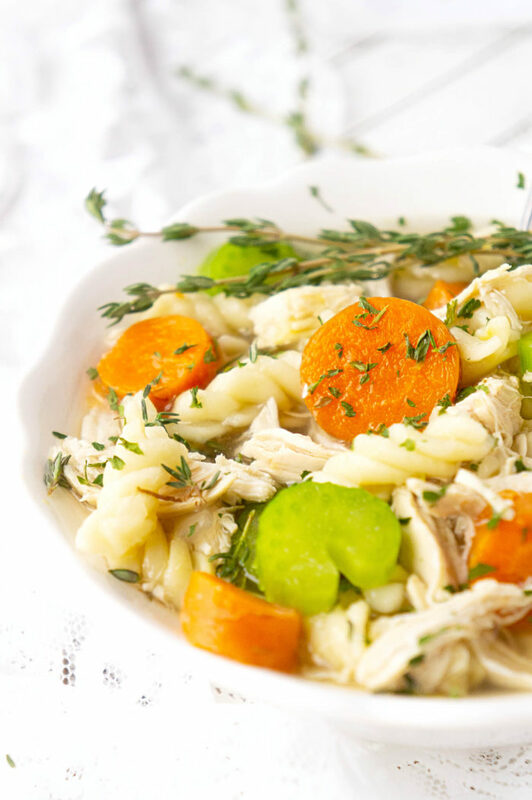 After all, every mama has to put her own special touch on homemade chicken noodle soup. 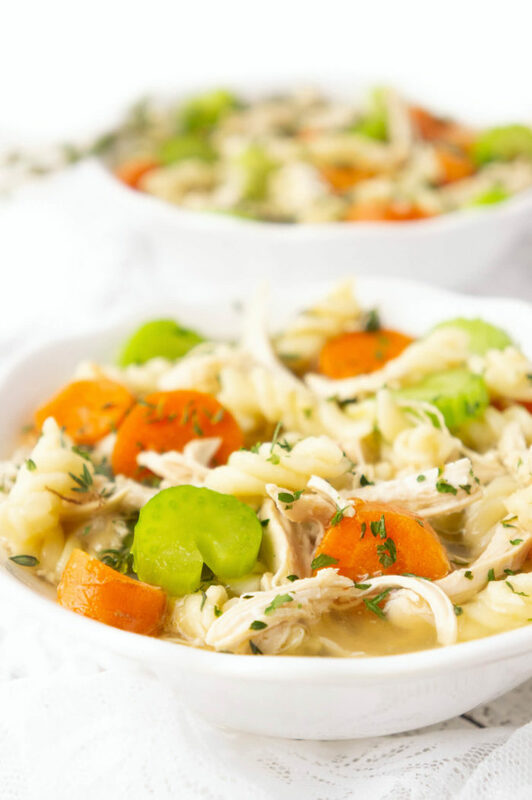 What I love about this version of chicken noodle soup is that it can be made all in one pot, it’s hearty and super easy to make. It’s also a balanced meal because you have your protein, grains, and vegetables cooked all in one pot. 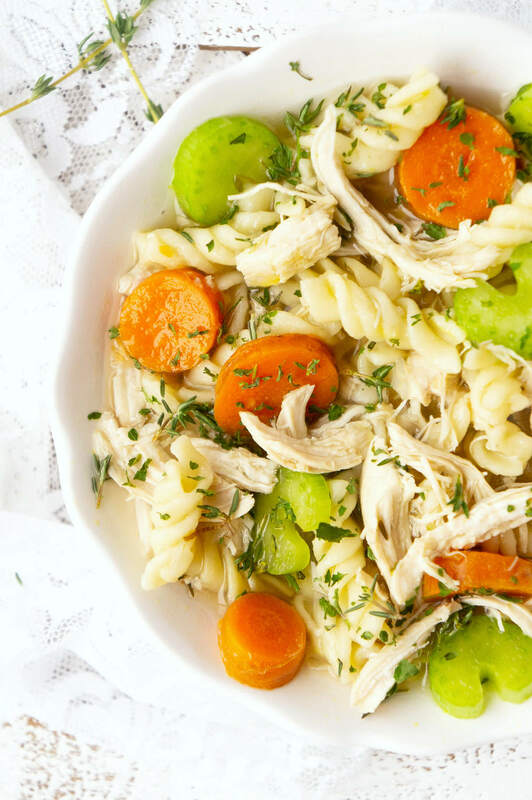 This soup is especially good for little ones because by cooking the chicken, noodles, and vegetables in the broth, it really helps to tenderize them, making it easier for them to chew. My 10 month-old downed it like a champ when I put all of the pieces of food on his tray. And I should note that he only has 1.5 teeth. Then I simply let him drink the broth out of the bowl. I think that was his favourite part. I’ve never seen anyone so enthusiastic about drinking chicken broth! What I also love about making your own chicken noodle soup is that you can control the sodium level. 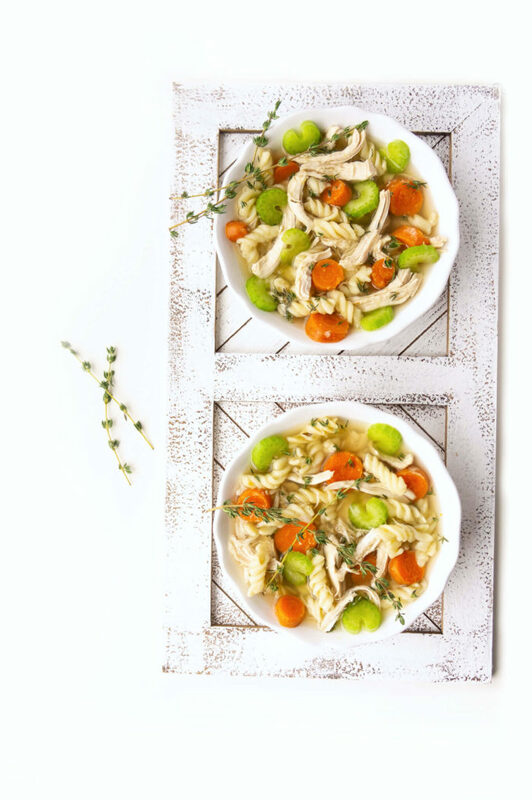 Canned chicken noodle soup generally is in the ballpark of 830mg of sodium for a one cup serving (which is about half to a third of your daily intake), but when you make your own, you can use reduced-sodium or no salt-added broth to control your intake. This is especially appropriate for babies under one year old since they should be consuming less than 400 mg of sodium per day, since too much sodium can be hard on their kidneys. For the pot of soup I made for our family, I used no salt-added broth and my husband and I each seasoned our own bowl of soup accordingly. This is one of the best ways to control individual sodium consumption. 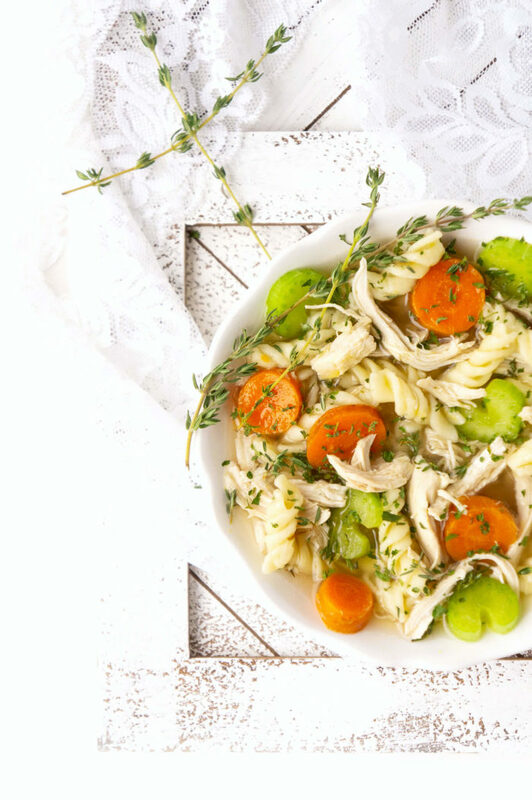 Another reason to love homemade chicken noodle soup is because it has a good balance of ingredients that contain immune-boosting properties. The carrots consist of vitamin A, which plays a role in immune response. 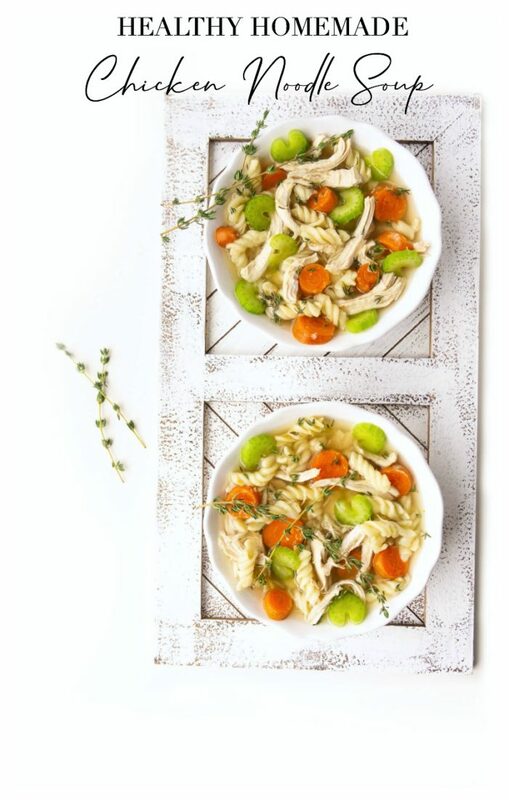 The chicken and stock both contain zinc which may help fight against the common cold when consumed in adequate amounts. Plus, by drinking the broth (especially if it’s lower in sodium), it can help you stay adequately hydrated which is not always the easiest thing to do when you’re sick. And let’s face it, when someone makes you a bowl of warm and cozy soup, it just makes you feel plain good, doesn’t it? Heat olive oil over medium heat and cook onion, carrots, celery and garlic for 5-6 minutes until softened and fragrant. Add the thyme and cook for an additional minute. Next, add the chicken broth and bay leaves. Turn the stove up to high and bring broth to a boil. Add chicken breasts to the broth and simmer for 20-25 minutes or until chicken is cooked through and no longer pink inside. Remove chicken breasts to a plate and shred using two forks. Meanwhile, add the pasta to the pot and boil for about 10-12 minutes or until cooked to desired tenderness. Add shredded chicken back to the pot. Season with salt and pepper, to taste. Sprinkle with fresh chopped parsley, if desired.